Elva Matthews Brown, affectionately known as “Grandma Brown” or “The Kissy Lady,” passed away peacefully at home on Saturday, May 19, 2018 at the age of 101. Elva was born September 7, 1916 to Henry Martin and Nellie Sonora Bryce Matthews in Glenbar, Arizona. She had five siblings, Helen Roxie Hostetter (Loren), Reta Barkley (Johnny), Hannah Louine Tate (Joffre), Henry Bryce Matthews (Doris), and Jeanette Starks (Delton). Elva was the wife of Egbert “Bert” J. Brown. As residents of Mesa, AZ, they spent a lifetime serving the community and their church. 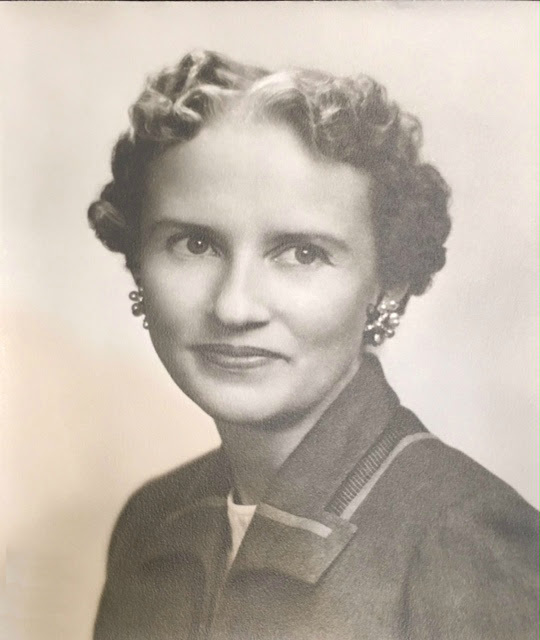 While Bert served as the Mayor of Mesa (1958-1966) and on many boards and committees, Elva enjoyed supporting her husband by hosting dinner parties and luncheons and participating in the Lioness Club, the Music Guild, and serving in various community functions. One of Elva’s fondest memories was the three years (1966-1969) she and Bert spent in Scotland where Bert served as a Mission President for The Church of Jesus Christ of Latter-day Saints. She loved the missionaries they served with, and fondly called them her “boys.” She had continued to keep in touch with several of them throughout the years. Elva served faithfully in many capacities as a member of the Church and loved attending and serving in the Mesa Arizona Temple Presidency (1970-1975). One of her greatest loves was spending time in the cool pines of Pinetop, AZ and then Shumway, AZ, where she and Bert had a ranch. Elva spent a lot of time in the garden at the ranch. Elva’s hobbies included, sewing, crafts, bowling (until she was 89), cooking, playing card games, and spending time with her family. She was also an avid Phoenix Suns basketball fan. She was one of the original ticket holders and never missed a game, whether in person or on television. She knew the names, stats, and personalities of each player and wasn’t afraid to tell them what they were doing wrong. Spending time with family and friends meant everything to Elva. It was important for her to know everyone she met by name, which she did. She had an uncanny memory for people and for making everyone feel like they were her “most favorite.” She always offered a kiss as a greeting and all who knew her loved her. She had a witty sense of humor and was kind, loving, and full of grace. She will be greatly missed and remembered fondly for her legacy of love. Elva was preceded in death by her husband, Egbert J. Brown; her only daughter, Elberta Brown Nielson (Lars); and her son, Wayne Brown (Kathye). She is survived by two sons, Duaine J. Brown (Deborah) of Oklahoma and Henry E. Brown (Mimi) of Scottsdale, AZ. Her posterity includes 31 grandchildren, 101 great-grandchildren, and 60 great-great grandchildren. Her family wishes to express gratitude to all those who lovingly cared for Elva over the past couple of years as she suffered the effects of age, especially Live Well Senior Care. She loved spending time with you. Services for Grandma Brown will be at 10:00am on Saturday, June 2, 2018, at the Lazona Ward of The Church of Jesus Christ of Latter-day Saints, 1345 E. University Dr, Mesa, AZ, with a visitation at 9:00am. A time to visit with the family will be held Friday, June 1, 2018, from 6:00-8:00pm at Bunker’s Garden Chapel, 33 N. Centennial Way, Mesa, AZ. She was always Mama Brown to me. Elberta and I loved to sneak in at night and get some of her delicious fudge. She never said a word to us but she knew who ate it. She lived such a long great life. Can you even imagine the joy and happiness they are all celebrating today!!!!! This was and still is one of the finest women we have ever known-she had class!!!!!!! She also raised our son Thanner ‘s 3rd grade teacher Elberta Brown Nielsen-one of the best teachers we have ever seen!!!!!!! Elva Brown never had an unkind word to say about anyone and she bore her trials in this life with dignity-surely there is a great reunion going on at this time-we hope to be in the same neighborhood in the next life!!! Saddened by Grandma Brown’s passing, but so happy she is reunited with Elberta, Wayne and the rest of her family who preceded her. Our condolences to this wonderful family! I was one of her Scottish kids,from 1967 til 1969! Lovely lady! My sincerest condolences to the family. No doubt she was a fine example to all her family and friends and I’m sure God has her safe in his memory. In time He will fulfill his promise to her and raise her up in perfect conditions where death will be no more. Isaiah 25:8. Please accept our deepest condolences for the loss of Elva. We pray that our loving Heavenly Father (Psalm 83:18) grants you peace during this difficult time. Sister “B” was the perfect Scottish Mission mother–truly an elect Celestial lady. We’ve always loved her. So happy she is reunited with President Brown, but sad we can’t just call her on the phone to say “Hello” and have our spirits lifted! She is one of our most-valued and glistening treasures from life and missions! May her family be blessed as she has blessed our family!